I picked up some super sweet strawberries at the Farmer’s Market last weekend since they are back in season. 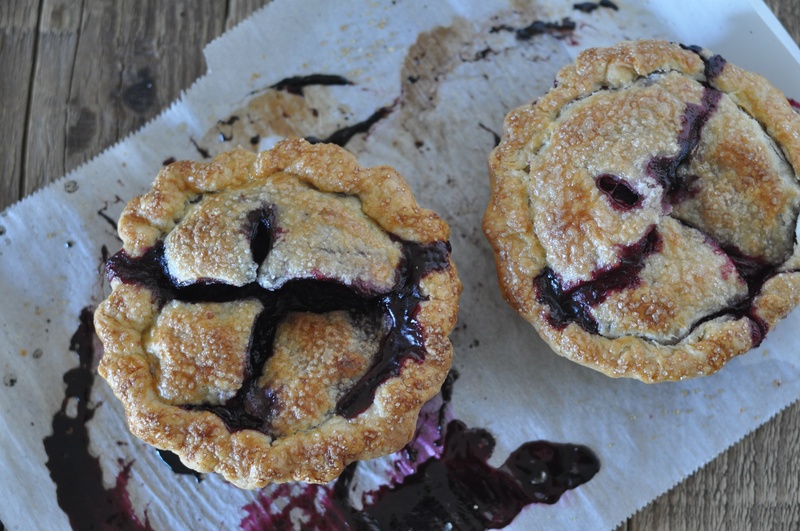 I love the combination of berries so I threw in some frozen blueberries and raspberries that I already had in my freezer along with the strawberries to make these triple berry pies. I have also been on a craze of making individual size desserts lately, so I used 4-inch ring molds for these pies. 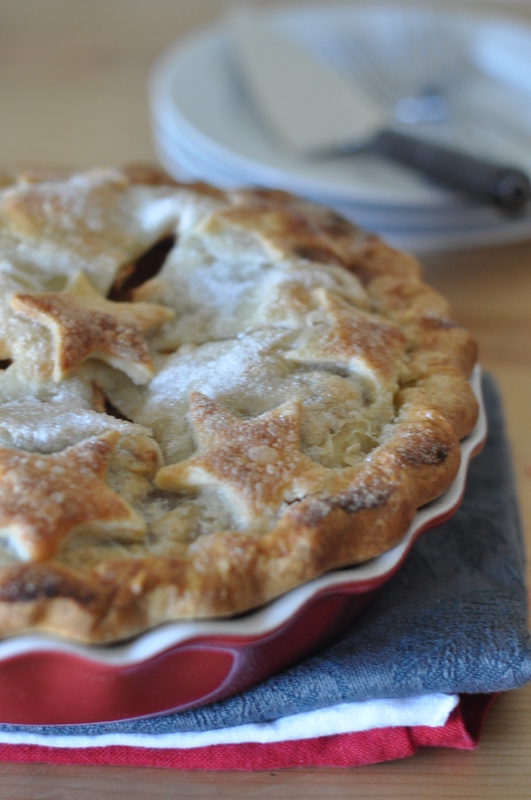 Of course, it is also possible to make a whole pie instead of individual ones. The pie dough recipe below will yield enough for 1 whole pie, and the filling recipe may have to be increased. 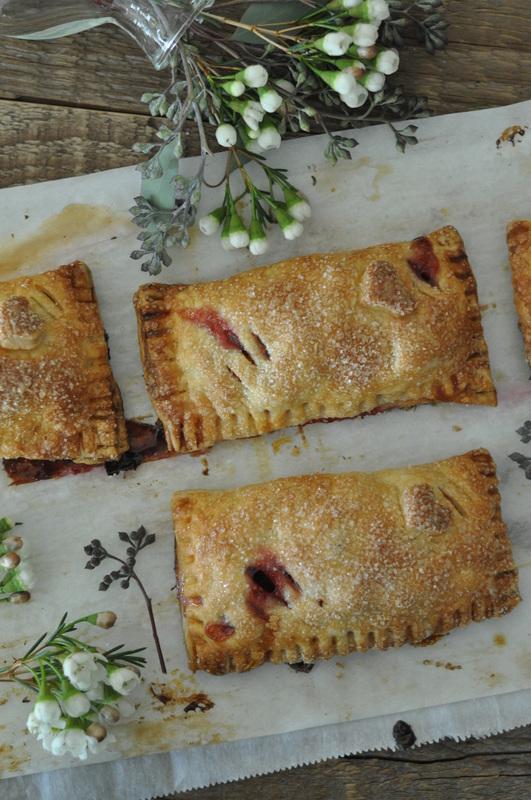 These pies taste best when fresh out of the oven. O, and if you have vanilla ice cream, I highly recommend slathering some on the pie. I guarantee you won’t regret it. 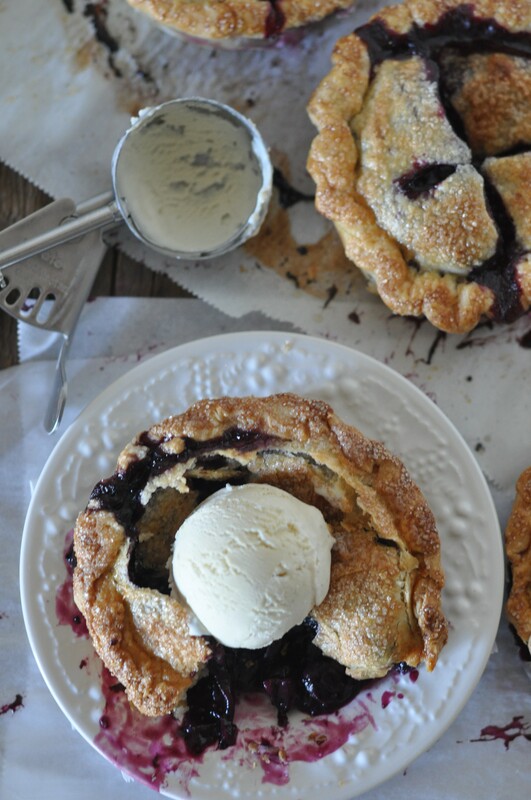 So if you don’t have any ice cream in your freezer, pick some up before you make these pies. Y= enough to fill four 4-inch pies. Roll out one half of the dough on a floured surface. 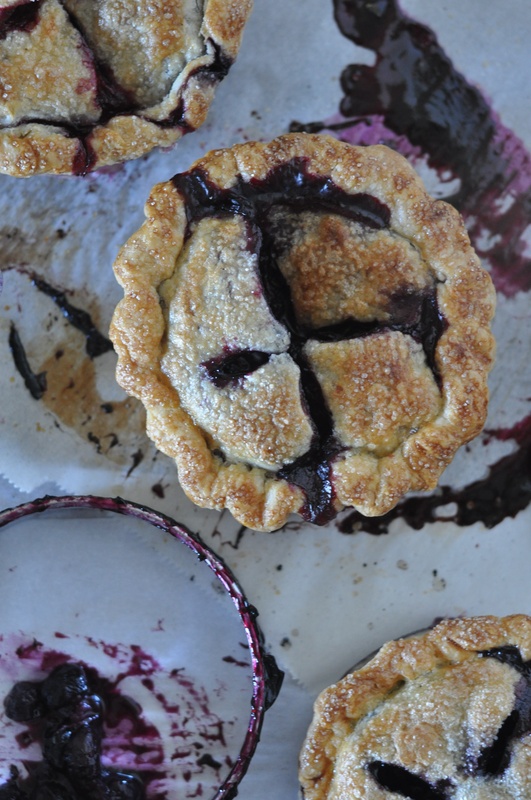 Cut pie dough to fit individual ring molds. Reserve some dough to seal the top of the pie. Fill lined ring with berries. Seal pie with the reserved dough. Trim off any excess dough along the edges and seal. 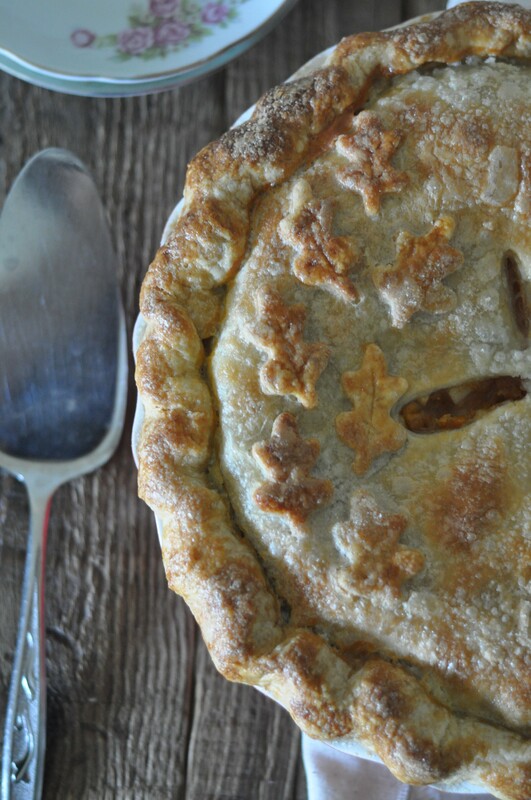 Make a few slits in the center of the pie. Egg wash the top of the pie and sprinkle with sugar. Bake at 375F for 30 minutes then rotate and bake for another 20-25 minutes or until browned. I spent the past week prepping a few items in preparation for a holiday party that took place last night. I made what I could during the week and baked whatever would keep in the refrigerator a few days before. 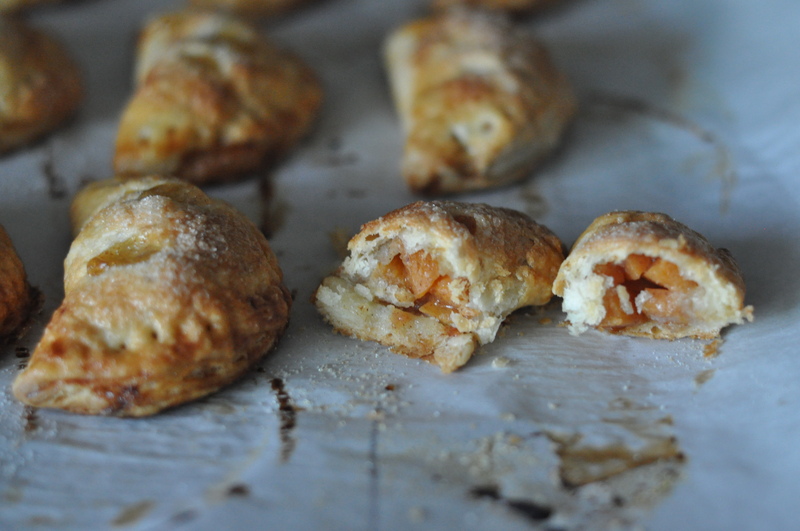 One of the five items that I made was an apple-persimmon pie, similar to the hand pies I made a few weeks ago. 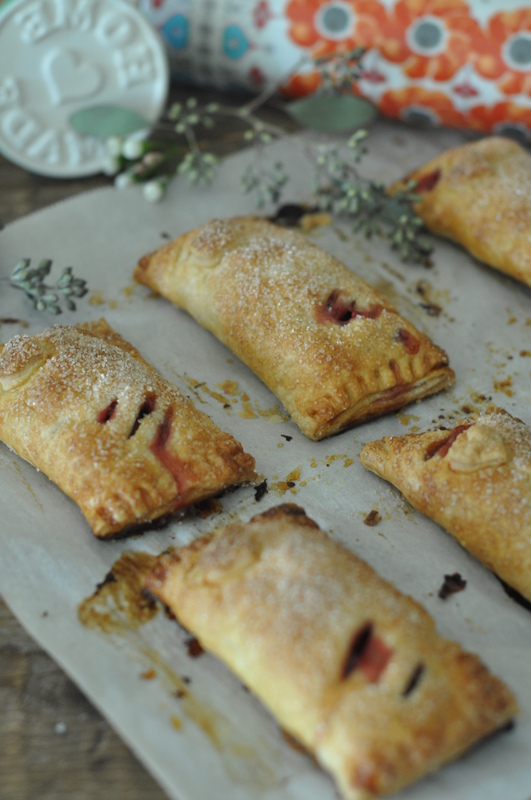 In fact, I used the same pie dough and the same filling recipe as the hand pies, except instead of making them individually bite-sized, I used my lovely 9-in pie pan. The filling can be prepared ahead of time and will keep in the refrigerator. The persimmon and apple pieces did not oxidize and turn brown since lemon juice was added. For this recipe, there is no exact number of fruits you should use. You can just eye-ball the amount of each type of fruit to use. I just started cutting the fruits until I got enough filling to fill my pie pan. If you want the persimmons to stand out more, use more persimmons. Or if you like the taste of apples, use more apples. 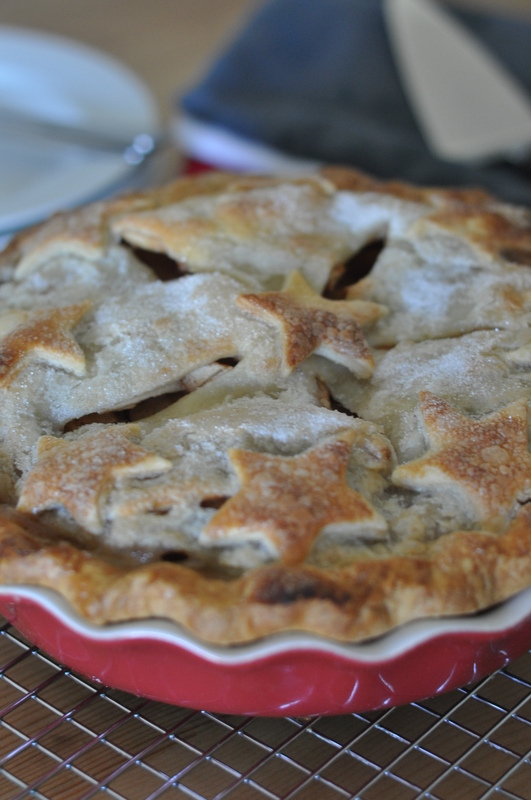 Needless to say, the combination of both fruits in the pie was a big hit with the crowd. I felt extremely satisfied when the pie was completely gone by the end of the night. Finish mixing the dough by hand on a floured surface. Divide dough in two pieces. Wrap, refrigerate and allow dough to rest for at least 30 minutes, or overnight. At this point, you can also freeze the dough. Roll out one half of the dough on a floured surface. Transfer the rolled out dough to the pie pan by carefully rolling it onto your rolling pin and laying it in the pie pan. Press the dough into the pan. Note: If you don’t have enough filling to completely fill the pie pan, feel free to use more persimmons or apples. Place diced apples and persimmons in a bowl. If not using immediately, place filling in a container and refrigerate. Pour pie filling in the lined pan and spread it out evenly. Place cubed butter pieces randomly on top of the filling. Carefully roll out the second half of the dough. Place on top of filling. Trim off any excess dough along the edges and seal. 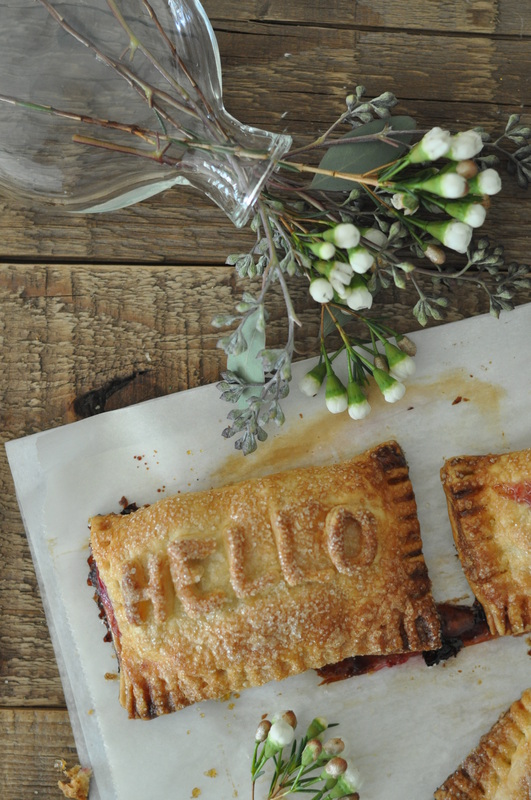 Optional: If you have extra dough, use fun leaf cutters to make decorative pieces. Bake at 375F for 45 minutes, then rotate and bake for another 20-30 minutes or until browned. Halfway through baking, I placed foil along the edges since it was browning faster than the center of the pie. 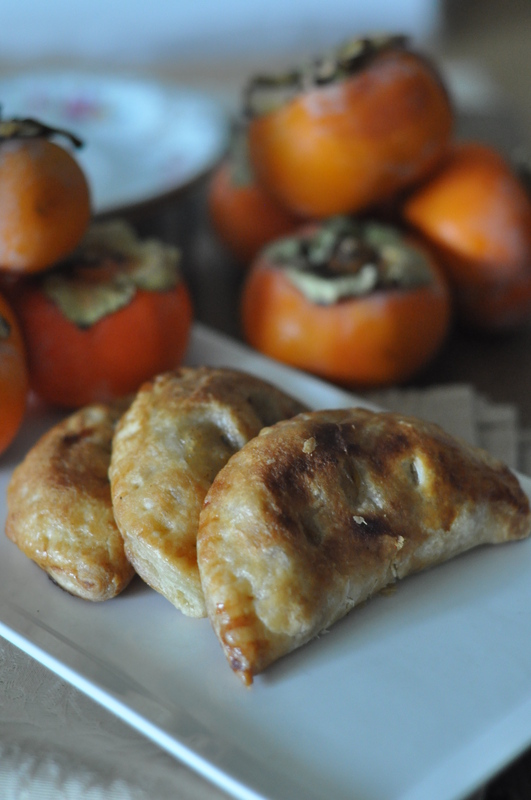 Each year around this time, I receive a LARGE bag full of Fuyu persimmons from my parents. They have a huge persimmon tree in their backyard and I am the lucky one who gets to enjoy the fruits. I always end up getting more than what my refrigerator can store and even after I handed some out to my coworkers, I was left with plenty more. 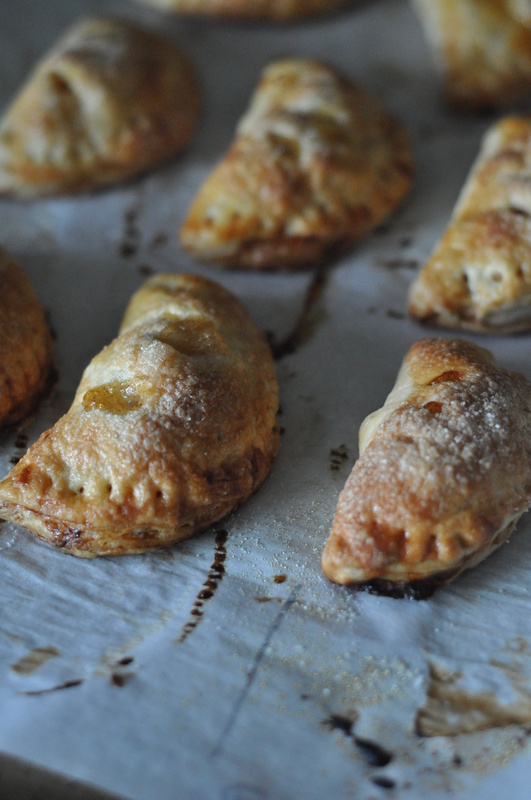 So instead of letting them go to waste by slowly rotting away at the bottom of my fruit drawer, I made an apple-persimmon pie filling for some hand pies. Since I had some pie dough left in my freezer, this was a quick dessert. 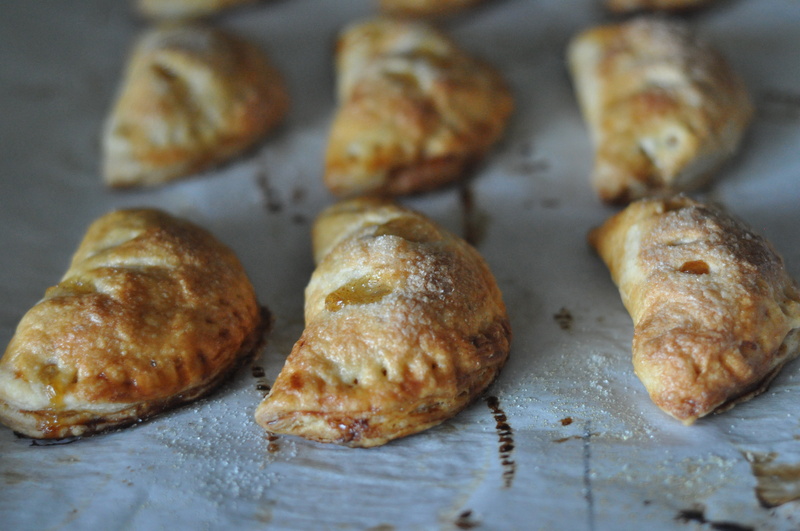 I made cinnamon apple hand pies before and they tasted great. However, having never baked with persimmons before this was a long shot. Needless to say, the apple-persimmon combination works well! 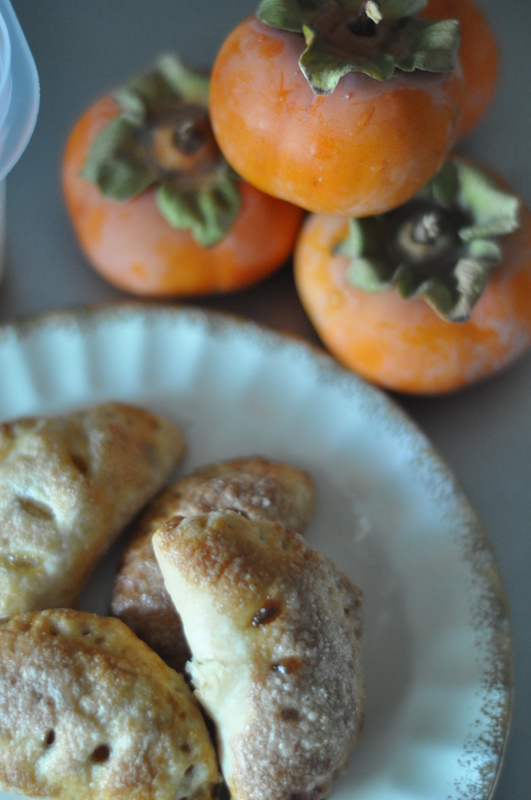 For this recipe I used the Fuyu persimmons, NOT the Hachiya, astringent variety. Years ago, I made the mistake of biting into a not so ripe Hachiya persimmon and was left with a mouth-puckering surprise – it was quite bitter and very unpleasant! Pie dough recipe can be found here. 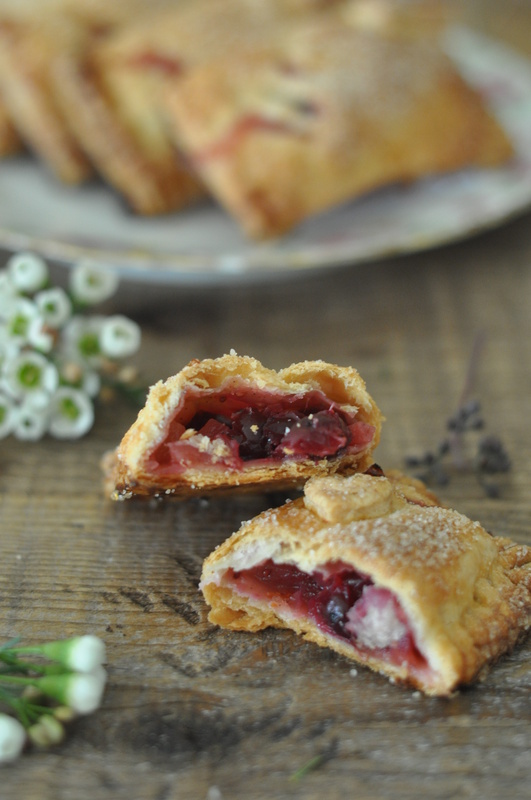 For this recipe I used half the dough and got 15 hand pies. 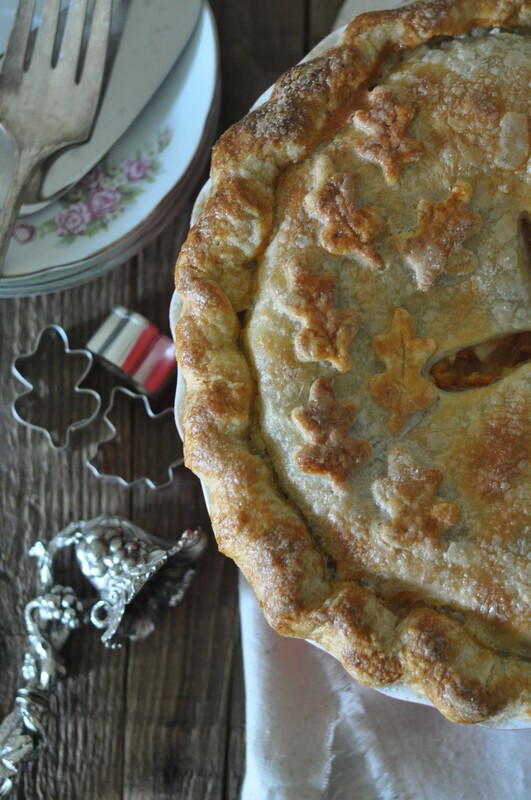 Roll out pie dough and use a 3-inch round cookie cutter to cut rounds out. Spoon mixture in the center of the pie dough. Brush some egg wash along the edges and bring opposite ends together to seal. Place onto parchment-lined sheet pan. Using a fork, crimp along the sealed edges. 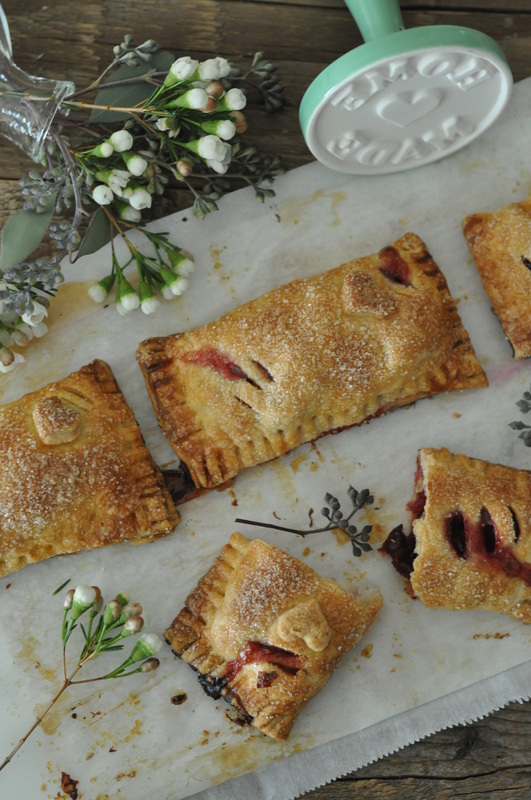 Once all hand pies are assembled, use a pairing knife to make 3 small slits on top. Brush the dough with egg wash and sprinkle sugar on top before baking. Bake at 400F for 20-25 minutes, rotating half way through. Pies are done when they are golden in color, but not burnt. Happy 4th of July Weekend! I had a nice, long, much-needed 4-day weekend of hanging out and doing random things around town. We spent a lot of time with our puppy, who turned 8-months today! To celebrate the actual holiday though, we hung out with a couple of friends over barbecue, drinks and of course, dessert. The gathering was a potluck, so I decided to make a pie to bring. 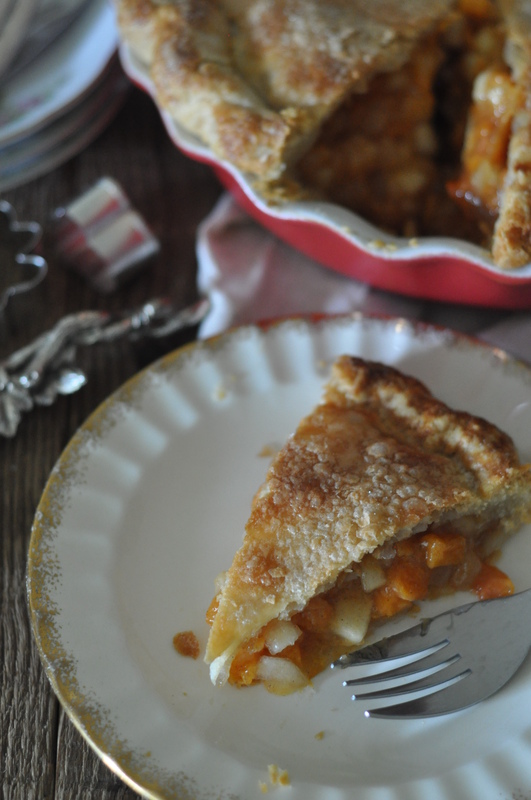 The original plan was a peach pie since stone fruits are in season right now. Unfortunately, after a small mishap, plans changed; just as I was pulling the peach pie out of the oven, my sticky fingers dropped the pie dish and the entire thing flipped upside down onto the oven door! This was a first for me and it was quite devastating. Sadly enough, the pie was not salvageable. 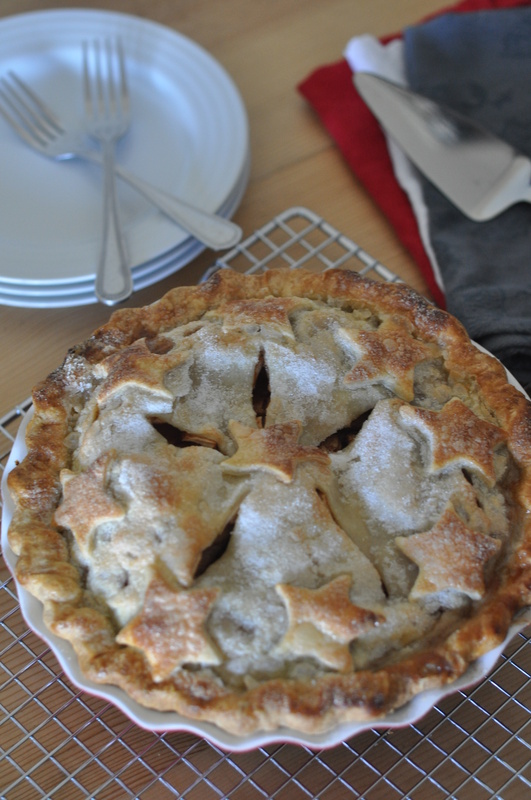 So the back up plan was a classic apple pie. 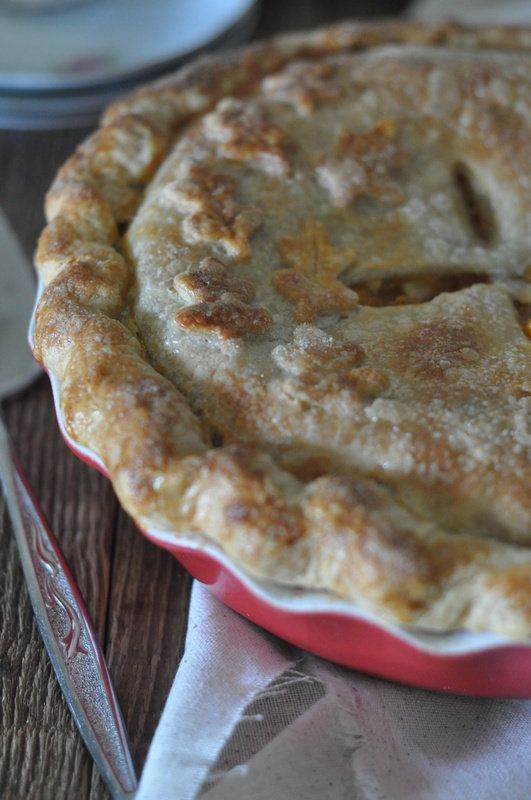 I could have scrambled and rushed to the market for more peaches, but I had plenty of apples already in the refrigerator, so I opted to make an apple pie instead. 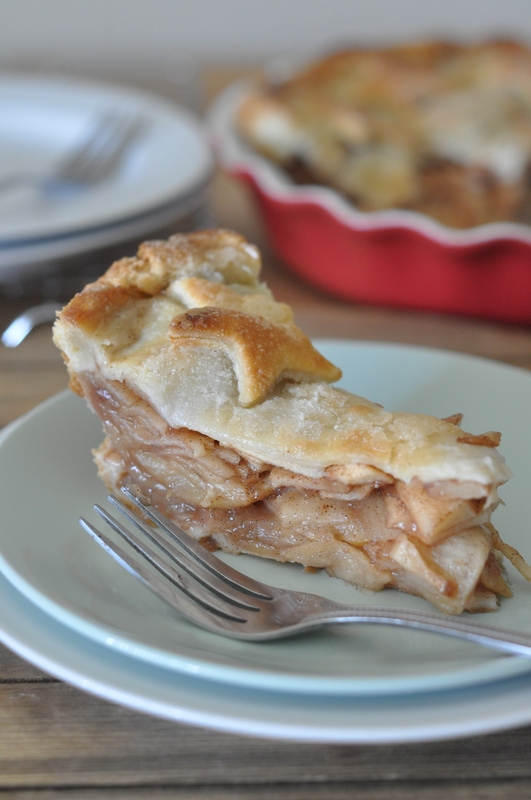 I love making this pie because it’s simple and you can’t go wrong with it. 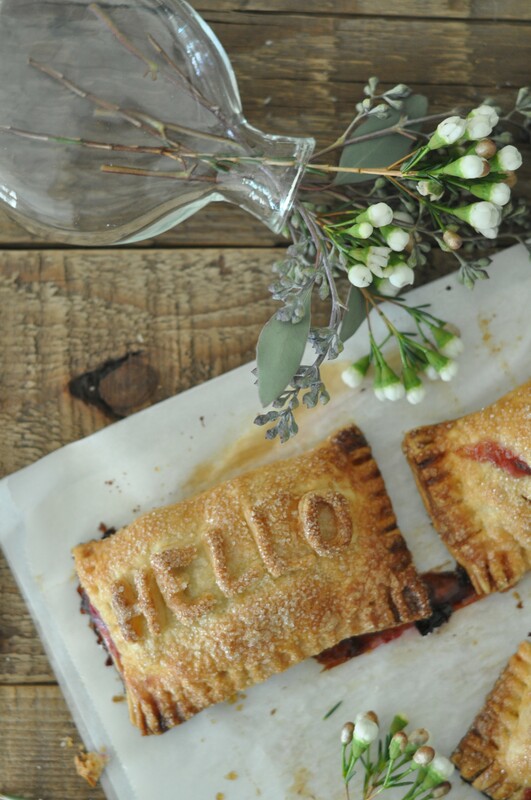 I mean, who doesn’t love an apple pie, right? This was served within two hours after it came out of the oven, and it was still warm. However, if you need to make it ahead of time, you can bake it, let it cool to room temperature, and slightly cover and leave it until the next day to serve. 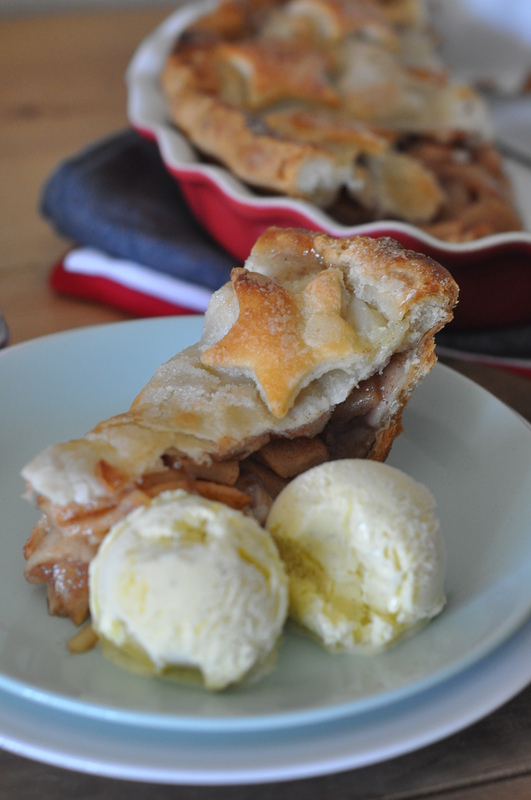 The best part of apple pies, or any other pies, is having a slice with some vanilla ice cream! 1. In a food processor with the dough attachment, combine flour, salt and butter. Pulse until mixture becomes crumbly. 2. Add the water and vinegar mixture in thirds, pulsing in between. 3. Finish mixing the dough by hand on a floured surface. Divide dough in two pieces. Wrap, refrigerate and allow dough to rest for at least 30 minutes, or overnight. 5. Roll out one half of the dough on a floured surface. Transfer the rolled out dough to the pie pan by carefully rolling it onto your rolling pin and laying it in the pie pan. Press the dough into the pan. 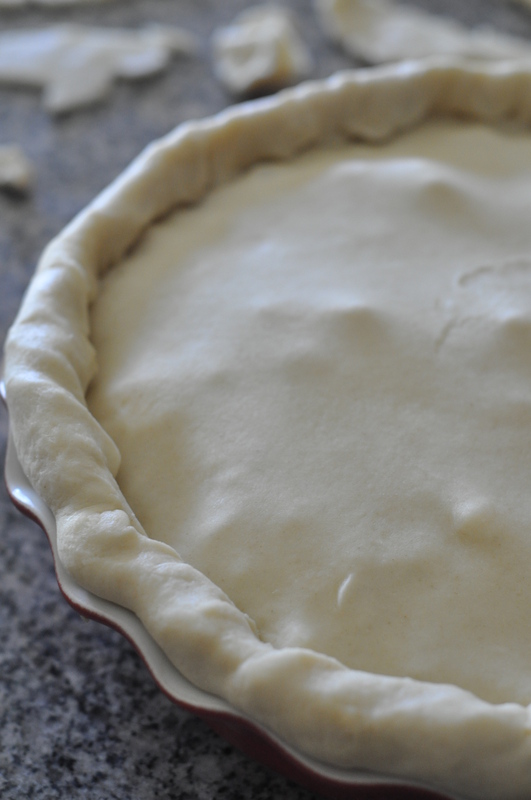 Refrigerate pie pan to set the dough. 1. Toss sliced apples, lemon juice, sugar, cinnamon, vanilla together. 2. Add cornstarch. Mix to coat evenly. 3. Pour mixture into pie pan. 4. Carefully roll out the second half of the dough. Place on top of apples and seal edges. 5. Make a few slits in the center of the pie. 6. Egg wash the top of the pie and sprinkle with sugar. 7. Bake at 400F for 40 minutes, then rotate and bake for another 20-25 minutes. Halfway through baking, I place a piece of foil over the top since I didn’t want the tops to get too dark. Paired with leftover homemade vanilla ice cream!